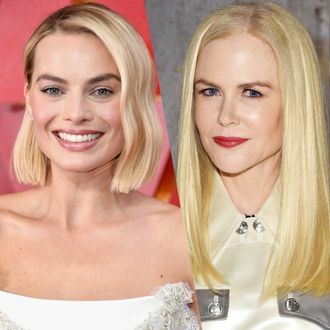 Nicole Kidman will star opposite Charlize Theron in Annapurna’s Roger Ailes movie dramatizing the former Fox News chairman’s downfall. Per Variety, Kidman will play Fox & Friends host Gretchen Carlson, who filed a sexual-harassment lawsuit against Ailes, which began his career’s unraveling. Theron will produce and star as Megyn Kelly in the untitled movie. Jay Roach (Game Change) is directing, with Charles Randolph (The Big Short) writing the script. After 20 years ruling over the Fox network, Ailes resigned in July 2016 following reports of sexual harassment and misconduct. Carlson was the first to file suit against Ailes, saying that he fired her from Fox because she refused his sexual advances. In her legal complaint, Carlson alleged Ailes asked her “turn around so he could view her posterior, commented repeatedly about her legs, and instructed her to wear certain outfits that he claimed enhanced her figure.” Ailes denied the allegations until his death last year. Annapurna’s Roger Ailes movie is one of two Fox-focused projects coming soon: A Blumhouse-produced Showtime limited series is in the works, starring Kidman’s Boy Erased co-star, Russell Crowe. Update: Because Fox News is an established purveyor of blonde privilege, yet another yellow-haired woman has joined the film. According to The Hollywood Reporter, Margot Robbie will play an associate producer at the news network. Get those roots retouched!